A scene from “JUST COME HOME,” the next Frank Nagler Mystery. In the dusky hours of midweek. Ironton streets bustling, shouting, sweaty dancing. Past the shuttered factories, windows wired, glass broken, spider webs of debris. He walked seeking ghosts, clues, understanding. Two old women don’t disappear. Past the dark coolness of bars, doors open, the blast of cold from air conditioners pushing against the sidewalk heat, dry and burning, leaking jukebox sounds, the clinking glasses of afternoon loneliness. Past the grumbling train station, soot covered seats, paint chipped, broken slats, an old lady clutching two shopping bags. An eastbound train grinds in, a whoosh of open doors, feet flat on metal stairs, slapping broken concrete, riders step from shade to glare and shield their eyes with a folded newspaper. A horn blast, squeaking metal wheels, then rolling, ground shaking, then silence. Past the dry river bed, leaning wearily on the hot metal Sussex Street railing, head down, squinting against the watery glare cast from the last pools hidden in dry rocks and sand. Water so low from lack of rain, the banks had dried, hardened, browned and cracked. We would have found you by now. Walked, called out, voice raw. Demanded; waited. Past the stoops, the blocks of neighborhood stoops; old men with straw hats and beer in brown bags, women in long, colored loose skirts yanked thigh high and waist-tied blouses yelling at kids with soccer balls to watch for cars; grandmas and diapered babies rocking in a corner of shade, sweat on soft cheeks, the sighs of innocence. Peered into alleys, down sun-baked streets, flashing sunlight off shifting windshields; into the wreckage of industries past, arched hollows in brick walls, birds flapping in gritty shade, plywood slathered doorways, dripping, softened to paper. Stared, seeking the soul of the city, ear tipped for a voice; questioned, waited for a whisper. 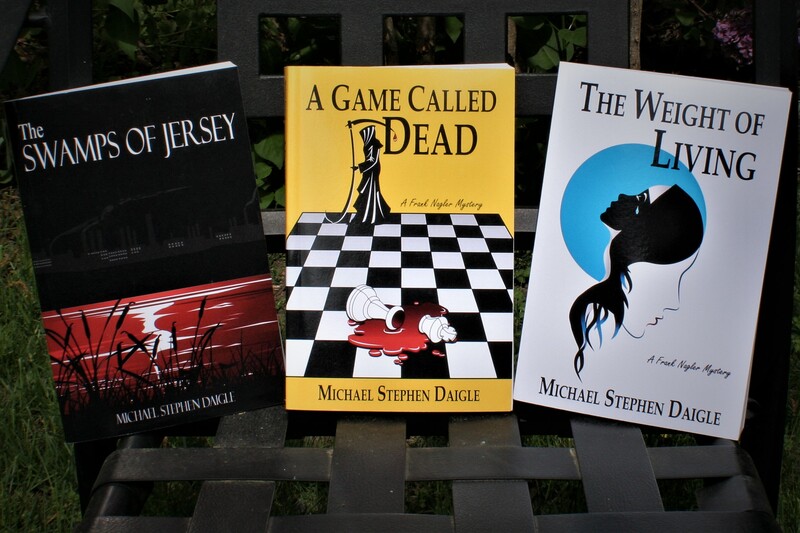 The previous Frank Nagler mysteries are: THE SWAMPS OF JERSEY; A GAME CALLED DEAD; and THE WEIGHT OF LIVING. Mountainside; Morris County Library; Somerset County Library System; Bernardsville Public Library; Hunterdon County Public Library; Mount Olive Public Library; Phillipsburg; Warren County, Franklin branch; Mount Arlington; Wharton; Dover; Hackettstown; Clark, Parsippany and the Ramsey library, as part of the Bergen County Cooperative Library System; The Palmer (Pa.) Branch of the Easton Public Library; Deptford Free Public Library and Franklin Township Library (Gloucester Co.), New Providence Memorial Library. This entry was posted in BooksNJ2017, Fiction, Greater Lehigh Valley Writer's Group, Hot in Hunterdon; Georjean Trinkle, http://www.sallyember.com, Imzadi Publishing LLC, Michael Stephen Daigle, Mystery Writers of America, www.michaelstephendaigle.com and tagged "A Game Called Dead", "Just Come Home", "The Swamps of Jersey" Imzadi Publishing, "The Weight of Living", Fiction, Frank Nagler, Ironton, Morris County, New Jersey. Bookmark the permalink.